Deandre Harris, a 20-year-old black man who was viciously attacked by white supremacists at the Charlottesville, Va., white supremacist rally almost two months ago, is now a wanted man after a local magistrate issued a warrant for his arrest in connection with the same Aug. 12 incident that left him bloody and wounded. Harris, according to WCPO, is now wanted on charges of unlawful wounding in connection with that same day, and is accused of attacking a man in the group who brutally beat him. Because this is how America works, friends, black people are in the wrong even when they are being beaten up. Harris’ attorney, Lee Merritt, slammed this new development as being “clearly retaliatory” on the part of white supremacists since Harris has turned to social media to identify those who beat him. Merritt said that Harris would turn himself over to police within 24 hours. 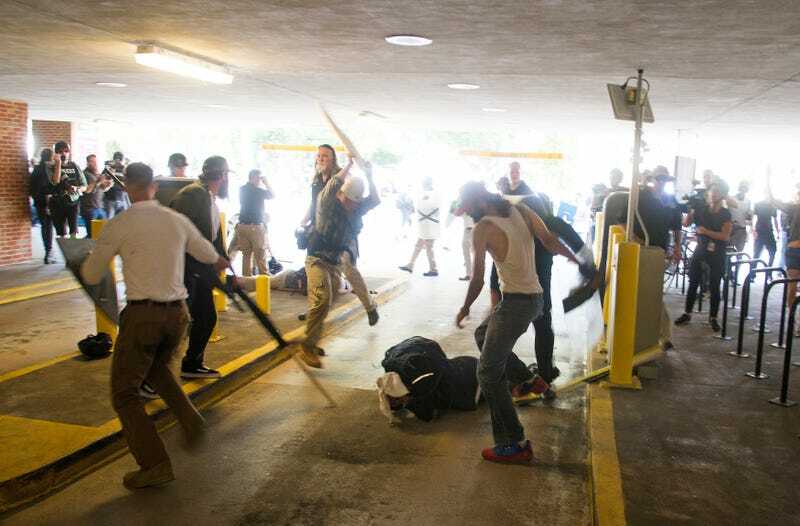 News of what happened to Harris that day in Charlottesville spread fast after photos captured by journalist Zach D. Roberts showing Harris being beaten with poles by the group of thugs quickly went viral. Another journalist, Chuck Modi, also posted video of the attack, which happened in a parking garage near the University of Virginia campus. Roberts tweeted that police still have not interviewed him about the beating to this day, even though he is a witness. Harris’ head injuries were so severe that he required eight staples. He also suffered a broken wrist and a chipped tooth. Since Harris’ beating, two of the suspects in his beating, Daniel Borden and Alex Michael Ramos, have been arrested. How Harris came to be a wanted man in this situation was not made public, but the Charlottesville police promised that there would be an explanation following the arrest. However, as WCPO notes, white supremacists on Twitter appeared to be celebrating the issuance of the warrant against Harris on Monday, with one white nationalist appearing to claim that it was a group effort to collect evidence on Harris.